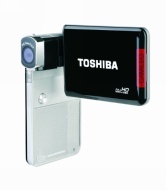 alaTest has collected and analyzed 146 reviews of Toshiba Camileo S30 Full HD Camcorder (Silver/Black). The average rating for this product is 3.1/5, compared to an average rating of 4.0/5 for other Camcorders for all reviews. People are impressed by the design and size. The portability and price are also mentioned favorably. The memory and zoom get critical comments. We analyzed user and expert ratings, product age and more factors. Compared to other Camcorders the Toshiba Camileo S30 Full HD Camcorder (Silver/Black) is awarded an overall alaScore™ of 78/100 = Good quality. alaTest has collected and analyzed 141 user reviews of Toshiba Camileo S30 Full HD Camcorder (Silver/Black) from Amazon.com. The average user rating for this product is 3.1/5, compared to an average user rating of 3.9/5 for other Camcorders on Amazon.com. Reviewers really like the design and size. The portability and price also get good views, whereas the memory and zoom get negative opinions. 64% of the reviews on Amazon.com give this product a positive rating. The Toshiba Camileo S30 is a full HD camcorder. We take it for a spin to see if it's picture perfect. At the end of the day, the Toshiba Camileo S30 is a good device and at its recommended retail price of R1,499 it borders on excellent.